Like Terramundi? Click here to view the entire range. A big wedding calls for a big money pot! 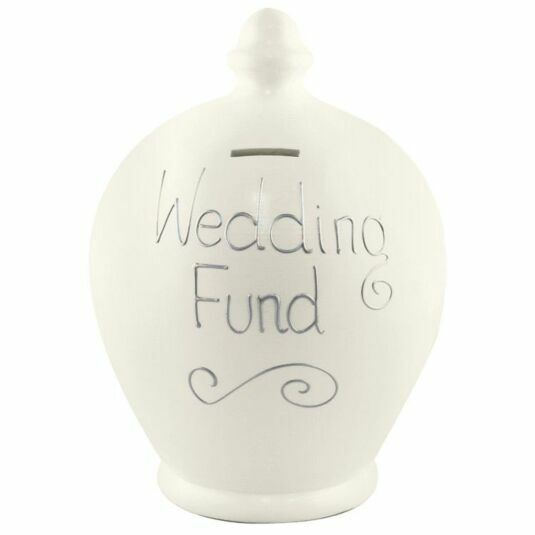 Make all those pennies count towards that special day with this white pot with with the words "Wedding Fund" painted on its front in silver. Ideal as a gift for the happy couple, this pot is a perfect choice for that special gift idea. This BIG money pot can hold between £3000 - £5000 in gold coins, stands at around 30cm tall, and due to its size takes a lot of skill to throw. Terramundi money pots are hand thrown in Italy to a design which is over 2000 years old. The British Museum holds early examples of such "Etruscan Money Amphora". One of our best-selling lines, Terramundi earthenware money pots are really making a name for themselves across the UK. Suitable for young and old, they are hand-painted in London in dozens of great patterns and designs, and we are pleased to offer a wide selection, all at HUGE discount!! There is no way to remove money from a Terramundi once you have put it in. By long tradition, a Terramundi money pot must be fed until it is full, at which time it must be smashed- releasing both your savings, and the fortune card which comes with every pot- whilst making a wish. A pot full of mixed silver can be expected to reward you with around £200. It is then customary to replace the pot and spend the money on 'good things'. The broken pots can be used as holders for plants and candles, or even as a desk tidy. We would recommend inserting the 'claw' of a claw hammer into the money slot, and levering upwards, in order to break off the top of the pot cleanly. More than 14 years ago in the upper floor of a flat in Kentish Town, Terramundi was born. Dario Illari and Jacquie Ryle were inspired by the money pots that have been traditionally used in Italy for over 2000 years, and their hand-thrown design has remained unchanged. You can even find some examples of these ancient money pots in the British Museum; there, we’ve just thought of something for you to do next weekend. Terramundi continue to go from strength to strength, with hundreds of pots with different messages, styles and colours. What doesn’t change, however, is the consistency of quality: hand-thrown in Italy, as per tradition, and hand-painted in London, Terramundi pots may be over 2000 years old, but they remain as brilliant a gift as ever.